These are a special collection of Howard Millers finest offerings. Hand-rubbed lacquer finishes, the finest Kieninger movements from Germany and unsurpassed personal attention to detail. Hinged side upper panel access doors, exquisite inlay and joinery make these selections like no other clocks built today. More time is spent in the construction of a Howard Miller Presidential Series Clock selecting and book-matching exotic Burl overlays and exquisite inlay across the cases. The Ambassador series features the same premium movements in more traditional cases. 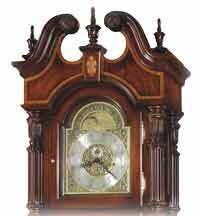 Presidential Series Grandfather Clock in Saratoga Cherry finish with light distressing. A graceful stepped, swan neck pediment features a book-matched olive ash burl overlay panel with a turned finial, rosettes, and a decorative shell ornament. Hinged top side doors and large reeded columns with turned column caps frame the doors. Glass mirrored back panel and locking lower front door. A Howard Miller Heirloom Record with brass-finished capsule is included. Cable-driven, triple-chime Kieninger movement features an automatic nighttime chime shut-off lever. Free Shipping with In-Home Delivery. Size: Height 92-1/2" Width 29-3/4" Depth 17-1/4"
This grand Presidential Grandfather Clock has many outstanding features. The swan neck pediment displays bookmatched crotch figured veneers. The pediment is further enhanced with three turned urn finials, carved rosettes, and an inlaid keystone with the "Prince of Wales" motif using Maple, Padauk, Amaranth, and Ebony veneers on a Madrona burl background. Four impressive columns feature large reeds and boldly carved caps that frame the distinctive door and adjoin the pediment to the base. Automatic nighttime chime shut-off option. Cable-driven, triple chime Kieninger movement offers automatic nighttime chime shut-off option. Size: H. 92-1/4" W. 29-1/2" D. 18-3/4"
The Howard Miller 611-234 Harold H. II Limited Edition floor clock with a nine tube, tubular chime movement is a new Limited Edition. This exquisite floor clock features simple, yet elegant lines with angled columns of Russian Walnut Burl veneers and a multi-tiered pediment and base with complementing angular corners. Hand rubbed, satin luster Cherry Bordeaux finish on cherry hardwoods and veneers. Chrome accents crown the pediment and carry through in the details of the column caps. Kieninger cable-driven, triple melody, nine-tubular chime movement features 36 bushings (24 bronze and 12 jeweled) and plays your choice of Westminster, St. Michael, or Whittington 1/4, 1/2, and 3/4 chimes accordingly with full chime and strike on the hour. Size: Height 83" Width 23.50" Depth 14.75 "
This elegant floor clock, designed by Chris Bergelin features sixteen different species of hardwoods and veneers. These are Cherry, Crotch Figured Mahogany, Russian Walnut Burl, Movingue, Maple, Ebony, Padauk, Silver Gum, Black Cherry, Magnolia, Beech, Avodire, Anegre, Pearwood, English Sycamore, and Boxwood. The beautiful swan neck pediment is crowned with three carved finials. Also on the pediment are bookmatched Russian Walnut Burl with floral inlays framed with a Movingue border. A masterpiece in clockmaking. This elegant floor clock, designed by Chris Bergelin features sixteen different species of hardwoods and veneers. These are Cherry, Crotch Figured Mahogany, Russian Walnut Burl, Movingue, Maple, Ebony, Padauk, Silver Gum, Black Cherry, Magnolia, Beech, Avodire, Anegre, Pearwood, English Sycamore, and Boxwood. The beautiful swan neck pediment is crowned with three carved finials A masterpiece in clockmaking. Sequential chime option Tubular Chime Triple Melody Movement. An extraordinarily detailed floor clock with bookmatched olive ash burl gracing the front and sides of the unique swan neck pediment, and a carved urn finial and finial support add the finishing touch. The Hampton Cherry finish is distressed for an aged appearance. The elaborate dial includes raised brass Arabic numerals, cast center and corner ornaments, and a moon phase with exclusive Presidential Collection hemispheres. Size: H. 93" W. 31-1/2" D. 18-1/2"
This handsome Hampton Cherry floor clock features a stepped swan neck pediment with book matched olive ash burl, a carved finial, rosettes and a decorative vine and shell overlay. The brushed nickel finished dial, pendulum and weights update the design of this classic floor clock. Applied satin black Arabic numerals and a moon arch with an astrological blue moon phase. The upper front door can be easily opened so that the movement can be wound and the time set easily. The use of beveled glass continues in the bottom sides. Size: H. 93-1/4" W. 29-3/4" D. 17-1/4"
Windsor Cherry finish. Narrow waist grand-father clock. Elegant swan neck pediment features crotch mahogany and accenting holly and ebony inlays. All glass is beveled. Intricate moon phase dial bears the Presidential collection inscription and features raised brass Roman numerals. Holly and ebony fan inlays are repeated on the lower door and again centered on the base. Base also features complementing crotch mahogany. Size: H.87-1/4 W.20 D.13 in. This stately floor clock in Royale Cherry with Cherry and Olive Ash burl veneers. Large reeded columns and richly carved column caps along with separate upper and lower doors. The stepped swan neck pediment with a carved finial rests upon the wonderfully carved shell design located under the finial seat. An individually numbered edition dial. Two Lamp illumination. This lower lamp offers a dimmer touch switch on the door hinge. A separate lamp illuminates just the movement and dial. The mechanical Triple Chime includes Westminster, St. Michael and Whittington melodies. An automatic night silence option comes with this movement as well. Two year warranty and Free In-Home Delivery.